In January, Janielle Wright went to bed afraid that she wouldn't wake up. Today, she is more than half way to meeting her 100-pound weight loss goal. Janielle Wright employed the intermittent fasting technique, where you only allow yourself to eat within a certain window of time, to cut her caloric intake. At 337 lbs, health and beauty influencer Janielle Wright was afraid she would die. Her body was in pain and she had trouble breathing at night. “I was going to sleep worried that I wouldn’t wake up the next morning,” Wright told NBC News BETTER. She was also afraid that she wouldn’t live to see her 3-year-old daughter, Novah, grow up. That was when Wright, 28, realized something had to change. “This is no way to live thinking you’re going to die because you’re overweight and you’re unhealthy,” she says. Intermittent fasting is a time-restricted eating method where you only allow yourself to eat within a certain window of time. 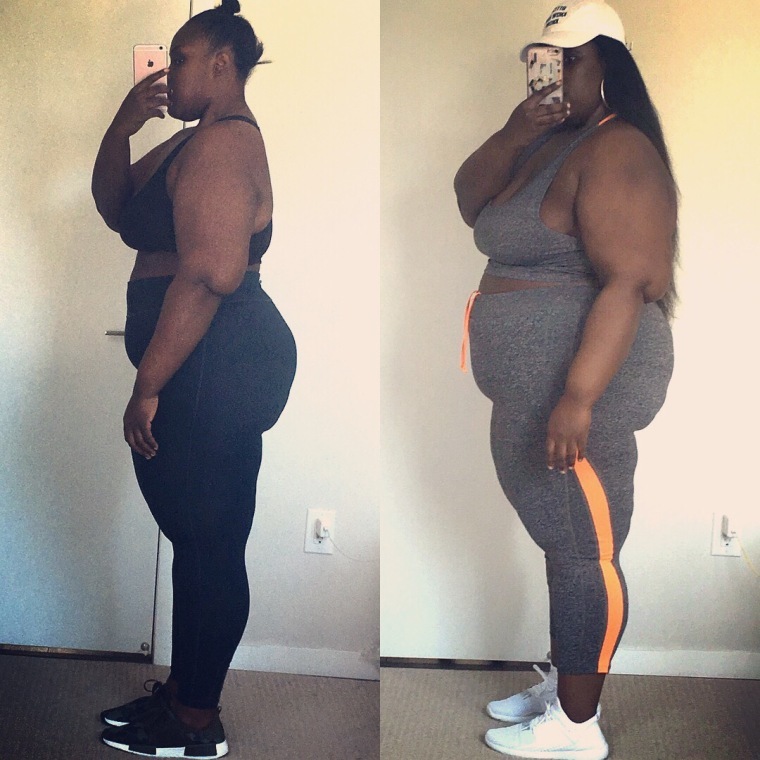 In January, Wright began her weight-loss journey through intermittent fasting. It’s a time-restricted eating method where you only allow yourself to eat within a certain window of time. Wright says the method helped her lose 65 pounds so far. Wright began intermittent fasting with the 16:8 method, which required her to eat within an 8-hour window and fast for 16 hours. She cut out breakfast, she says, and ate just two meals a day — the first at 12 p.m., and the last meal around 8 p.m.
Wright says you should be cautious about using a more restrictive method like the 20:4. Condition your body on a less restrictive method for an extended period first, she says. Since the window of time for eating on the 20:4 method is small, Wright says you should be careful to space your meals apart and not eat all your calories in one sitting. One thing Wright enjoys most about intermittent fasting is that you decide what kind of foods you want to eat (she prefers a low-carb diet). But she warns against junk food. “I’ll have egg whites and spinach, and I’ll have some carrots fruit on the side ... [or] I’ll have maybe a chicken breast with some quinoa on the side,” Wright says. Fasting for long periods of time can become tedious. That’s why Wright lets herself have three cheat meals a month. Whether it’s nachos, Chinese food or a Subway sandwich, cheat meals help her stay balanced, she says. But she warns not to overdo it. “Once I’m done with my cheat meal I move on,” says Wright. Wright incorporates exercise into her weight loss routine, working out out six days a week. Since she had a lot of weight to lose in the beginning, she was careful not to push herself too hard at first — just a brisk 15-minute walk on the treadmill each day. “But as I got more comfortable with walking on the treadmill, I upped my time and I upped my speed and my incline,” she says. After seven months, Wright now walks on the treadmill about 45 minutes a day. She includes high inclines and keeps at “a really brisk [pace].” Afterwards, she does about 30 minutes of high-intensity interval training. Wright says intermittent fasting is effective because it taught her self control. Since the rule required her to stop eating at 8 p.m., it prevented her from snacking before bed. When you are intermittent fasting, Wright explains, it’s easy to become obsessive about timing your meals. She says it’s important to not be too fixated on time. The key to being successful with intermittent fasting is to be consistent and not to lose patience, advises Wright. She says it took her many years to get to 337 lbs, so it’s important to understand that losing the weight will also take a long time. At 272 lbs, Wright’s weight loss journey isn’t over. But she says she can do things now that she wasn’t able to do before — like cross her legs when she sits and get down on the floor to play with her daughter. “This weight loss is such a blessing, and I’m so excited to see where this journey is going to take me,” Wright says. Her goal is to lose 100 pounds by the year’s end. Make sure you choose healthy foods. Eating healthy food is important when you are on an intermittent fasting diet. Make sure you are getting all the macros you need - fat, protein, and carbs, and eat nutritiously diverse meals. Allow yourself some cheat meals. Intermittent fasting can become tedious over a long period of time. Allow yourself to have up to three cheat meals a month, but be careful not to overdo it. Exercise consistently: Exercise will help boost your metabolism to lose weight. Depending on how much weight you need to lose, pick a routine that works for you. Intermittent fasting teaches discipline. Because you cannot eat once your fasting period begins, intermittent fasting will prevent you from snacking and will train you to be disciplined around food. Be consistent and stay patient. If you have a lot of weight to lose, keep in mind that you will not lose it over night. Consistency and patience are key.